How Do I Name My Podcast? Today we’re answering a viewer question from Karrie who left a comment on one of my videos. Now, when it comes down to the creation process, and you’re in that state of getting everything together, the name is going to be either something that is predetermined, or you still have to come up with it. The name shouldn’t be the one thing that is holding you back. Let’s consider a couple of things when it comes down to naming your podcast. Is your podcast going to be search engine optimized? Search engine optimization means that the name is something that is going to be searchable inside of Google. If we take, for example, the Social Media Marketing podcast, by Michael Stelzner, you're going to see that he shows up first in a Google search, iTunes search, Stitcher search or wherever he has placed his podcast. On Michael’s part, that was a very strategic move to create a podcast that revolves around these keywords, and of course, it fits Michael’s brand. Now, should you do something like this? It depends. Do you wanna have an accompanying business that is going to go along with those words? Or are you just trying to get more ears on your podcast? You have to really think about these things when it comes down to naming your podcast because it’s going to affect you later on down the line, and you certainly don’t wanna rename the podcast. What makes a good podcast name? Honestly? The name that is good for you. It's going to be the name that fits for you and your brand. It's going to be the name that’s going to fit for you and your podcast. Think of a name that is going to fit for you, and that is going to be memorable for you. I'm serious. Don't rush the name of your podcast, but certainly don’t make it the one thing that is holding you back. What I recommend that you do is that you give yourself about a week to decide on names. During your "creative" week, write down the potential names on your podcast. This is what I did when I named my podcast--I wrote down a list of potential names that I thought could work for me. But I want to stress something here--don’t leave the podcast names in your head. Get them out of your head and onto paper, because there’s no better way to understand and see how a podcast name looks if it’s not written down on paper. Then start choosing from that point forward start deducing your names down to the three. From that point forward you can go ahead and name your podcast based off the one you see is the best one to choose. If we think about a podcast about people who are about ready to turn 30, what are some common phrases that you have in conversation? Get it? Common phrases. And believe it or not, Almost 30 is an actual podcast name. There’s a podcast that one of my friends started which is called, You’ve Been Erased. It’s a podcast that reviews 80s and 90s action movies. You’ve Been Erased is something that Arnold Schwarzenegger has said in that movie, Eraser. Of course, in the case of my podcast, Be The Experience, that’s a very personal name for me. I chose that name because it has meaning and value for me behind it for me. When you listen to the podcast and read the description, you know why I chose that name. This is really a personal preference when you think about it. I mean, we listeners already know they're listening to a podcast, so there's no sense in putting the name, "podcast" after the title of you program unless it's actually a part of the name. The description of your podcast is going to be written somewhere inside of Libsyn and in Blubrry--that will describe what your podcast is about--and you can write the word "podcast" in there. 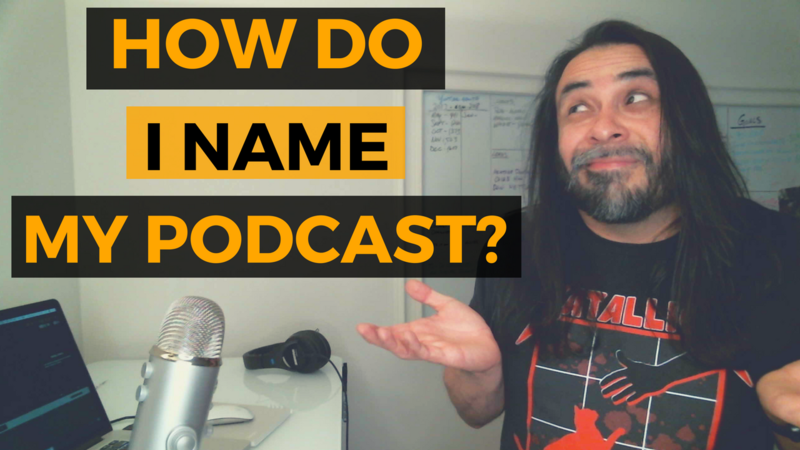 Let’s ask the question one more time, what makes a good podcast name? Your podcast name and how it gets out in the public is going to be all on you and how you market your program. It’s going to be all dependent on you and your due diligence to market to the audience that is going to find your content inspirational, interesting, educational, and entertaining. Your podcast name is going to be the one that is going to resonate with the audience that understands and likes your content the most when they come to listen to it every week. Make your name a good one and stick with it.